A Strategist in Exile is a very well researched book! It details Xenophon’s search for the Peloponnesian War chronicler Thucydides. Thucydides was charged by the regime of the Thirty Tyrants and then disappeared. Thus enters Xenophon, who was searching for Thucydides and his attempt to save many historical documents that had been put in Thucydides care. The book is divided into a discussion of the evidence and historical facts as well as a created, fictional narrative to help tell the story. Nickel begins by setting up the historical background for his narrative. He explains that Xenophon is invited on a journey to Persia by his friend Proxenus in 401 BC. This journey was actually to become the military adventure known as the march of the ten thousand. Nickel states that while Xenophon did join the expedition, his reasoning is not to find or make contact with Thucydides who is missing. This is the motivation for Xenophon in the narrative that Nickel sets out. Xenophon’s search for Thucydides ultimately fails in the narrative as it does in history. The narrative describes the rise of the Thirty Tyrants and their reign. He goes through the atrocities they committed, mentioning Socrates' trial, the role of the Sophists, and Critias’ involvement. Nickel details the march of the ten thousand from sources that have survived and then takes many creative liberties to flesh it out in the narrative portion of the book. The main portion of the book is following this march and the events that occurred throughout. The book concludes at the end of the march and gives details of the events that happened directly after the march in Xenophon’s life. This book was quite interesting to read. The information in it was good, and the creative liberties taken by the author were enjoyable to read. However, the style that was chosen, alternating between historical fact and fictional narrative, made the book hard to get into and really get invested in the information and the story. It was useful to see what historical facts lined up with the narrative, but the breaks made it hard to consistently read without getting lost and having to go back to see what part of the narrative was before the history. Overall it was a good book and not a bad one to read to get a general overview of Xenophon and Thucydides. I would recommend this book for someone looking to get a general overview of these two characters and the history that surrounds them. Nickel, Rainer. "A Strategist in Exile: Xenophon and the Death of Thucydides." Ancient History Encyclopedia. Last modified October 14, 2016. https://www.ancient.eu/review/151/. Nickel, Rainer. 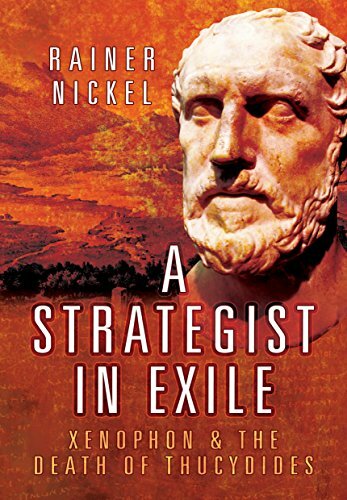 "A Strategist in Exile: Xenophon and the Death of Thucydides." Ancient History Encyclopedia. Ancient History Encyclopedia, 14 Oct 2016. Web. 20 Apr 2019.